I've discovered Babylonglegs and I think I'm doomed. I'd glanced in her direction before of course, having been pointed there by both Claire and Mandy, but I've managed to resist her charms until today. What can I say... I blinked and some very pretty fluff had fallen into my shopping cart and the next thing I knew I'd paid for it as well. With more fluff on order, I also spoke to the lady at work who has a small holding this morning. She promised me some fleece from their flock a few months back but I put her off as it was the middle of winter. I see washing, drying and dying fleece as very much a spring to summer activity. When I caught her this morning her reaction was to say "Just the one bag?" with a hint of disappointment in her voice. They've been having trouble getting rid of it, although I think they found a co-operative to take some of last years sheerings. Anyway, I've said to bring me one bag of fleece to start with and I'll take a look at it and may arrange to take more off her hands later. I've no idea of the quality of the fluff at this stage (or the going rate for raw fleece for that matter), so one to wait and see on really. 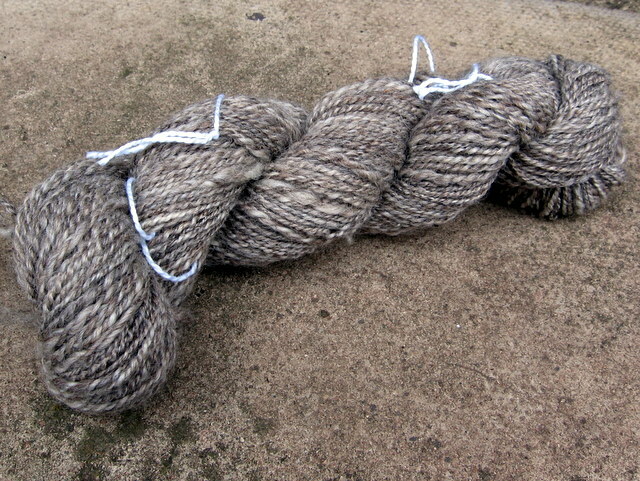 In the meantime, I've plied up my first every skein of wheelspun! 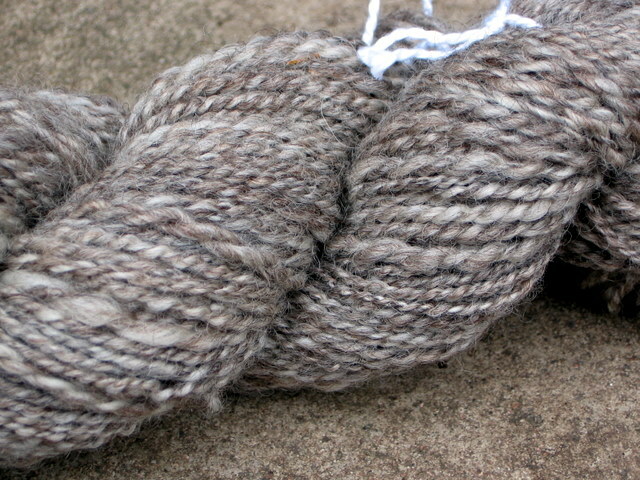 This is Blue Faced Leciester in Humbug, from Wingham Woolworks and this picture is of the yarn straight from the wheel. 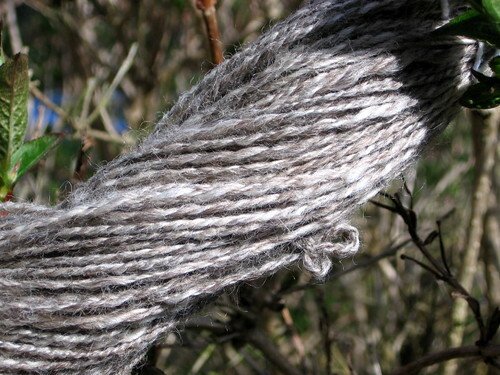 I'd quite literally just plied it and you can see it's twisting back on itself. Plying was a new experience for me. I've tried plying on the spindle before, but didn't see very good results possibly because I was working with my first singles and the quality was very iffy. I also didn't know how much twist you need to put into the singles to get them to twist into each other properly, which having worked at plying on my wheel (which I still need to name) I can now say is quite a lot! Plying took me a long time for three reasons. Firstly, I have this tendancy to spin relatively skinny singles and a full bobbin of such singles is an awful lot of yarn! Secondly was the aforementioned lack of understanding of just how much twist needs to go into plying two singles together. It turns out that if the singles are tightly spun as mine are (being relatively skinny) and have been allowed to rest for a variable amount of time, by which I mean a couple of days to several weeks in the case of one of the bobbins, there's an awful lot of countertwist needed to even out the yarn. Even so, it was a bit hit and miss as I tried to find my rhythm and eventually discovered I needed something in the order of fourteen treadles to adequately ply about eighteen inches of yarn. And finally, my wheel fought me! Or at least she did at first. I'd spun on her only a couple of days before with no problems but when I tried to ply, she refused to play ball. The yarn wouldn't take up and when I adjusted the brake band so the bobbins would wind on, the flyer wouldn't turn. Raising the whorl which tightened the drive band was good, only suddenly the yarn wouldn't wind on again. Rinse and repeat, until the tension was so tight I couldn't keep the wheel moving. A cup of tea later and I referred to my now to be considered bible of spinning, Start Spinning: Everything You Need to Know to Make Great Yarn by Maggie Casey, turning my attention first to her chapter on plying and then back to her introduction to the wheel. After a good hour of tweaking, I had a much better understanding of how the tension between the drive band and brake band compliment each other and I learned the benefits of tiny, tiny adjustments while spinning. Suddenly, I was plying. I stopped about three hours later when I ran out of room on my only free bobbin and my shoulders hurt. I let the newly plied yarn sit overnight and then wound it into a skein straight from the wheel. I don't have a niddy-noddy, so used two chairs back to back, which while a bit fiddly did the trick. I tied it, photographed the skein draped across a bush in the garden and then washed it as directed by Maggie Casey. Here it is hanging up to dry in the bathroom. 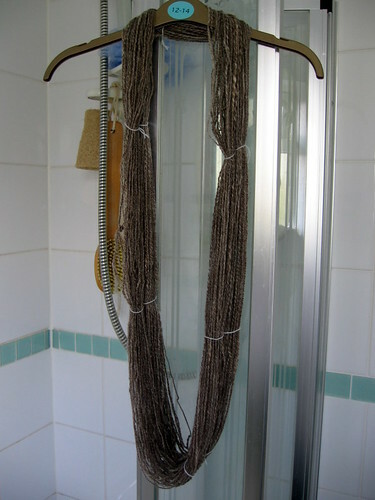 After wrapping the wet skein in a towel to get rid of most of the water, I snapped it between my hands to even out the yarn after which it hung open all by itself (which it didn't do straight off the wheel) so I didn't weight it as it dried. That's approximately 145m of something like a sock weight yarn. I haven't done a wraps count yet and the yarn is of variable thickness, so I'm not sure how accurate one would be anyway. In places it's underplied but mostly, it looks exactly as it should and I'm very pleased with the result. In fact, I keep picking it up, squishing it and grinning a lot. Looks fab! well done you. yea go Julie !! that yarn looks great.When you get your bag of fluff from work I'd like to see it.. I would like to get my wheel back out of storage this year and/or do more felting so might be interested in some.. Do you know what breed/s she has?